of day walks averaging 16 - 22 km (10 - 14 mi) and short overnight trips where possible. * R-Value refers to a measurement of the insulation value based on the mattress being fully inflated. A higher R-Value theoretically means the mat will provide better insulation. The Therm-a-Rest ProLite 4 is the lightest and most compact 4-season mattress that Therm-a-Rest produces. It is part of their "Fast & Light" series. "Ultralight: Innovative new materials reduce weight by 25%. Compact: Tapered ergonomic design rolls up super-small. Nonslip: Super-grip bottom keeps mattress from slipping." The manufacturer recommends the ProLite 4 for mountaineering, winter camping, backpacking, and multi-day adventures. Western Australia is known to bushwalkers for the Bibbulmun Track which runs from Perth to Albany (nearly 1000 km or 621 miles long). The many tracks that lead through this area also make up most of my walking. forest tracks and Park Ranger (Conservation and Land Management) gravel roads make up the majority of the access points to the track. Elevation is from sea level to 585 m (1,920 ft). The ProLite 4 has been used mainly around the Bibbulmun track as this is an area great for hiking. Walks can be from a few hours to 6 weeks to complete end-to-end. All of my walking has been on this track and its surrounding areas. I have completed several sections of the track at the northern-most end and spend several days out walking per month. The layout of the tracks means that I have been able to walk between huts which are generally one full day's walk apart, 16 � 22 km (9.94 � 13.66 mi). May this year I completed four days and three nights hiking covering some 70 kilometres or 43.48 miles and utilised the mat for the duration. As I have been testing this item of over 18 months an exact temperature, wind and rainfall pattern is difficult to monitor myself. The details in the table below are courtesy of the Australian Bureau of Meteorology. This mat has been used in all the months below. The Therm-a-Rest Prolite 4 was the first piece of gear I purchased when I started overnight backpacking in 2006. It has accompanied me on approximately twenty nights. The upper side (orange colour) of the mattress material is made from 100% polyester and the underside (black colour) is 100% nylon. Internally the mat is made from a diamond cut 100% polyurethane foam. I have been a little disappointed with the self-inflating properties of the mat as it takes over five hours to be at point where I consider it to be fully-inflated and ready to sleep on. Each time I have used this mat over the past two years I have resorted to inflating it by blowing into the plastic valve which does not take too much time nor is a big effort. There are no listed inflation times on the manufacturer's website. The valve is designed to be opened by turning anti-clockwise and closed by turning clockwise. It also has a feature whereby once opened it can be pulled out slightly for manual inflation, then between breaths you simply push it back in (no need for turning) to avoid air loss. 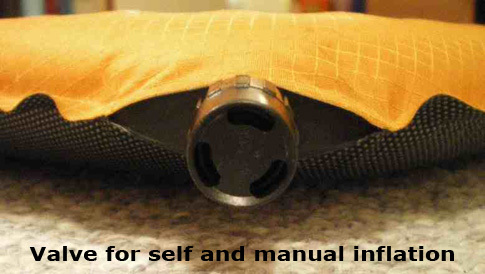 The mat is easily deflated by opening the valve and forcing the air out by compression. The method I use is to open the valve, fold the mat in half length wise then starting at the foot end of the mat I roll it up applying downward pressure, with my knees and hands, to force the air out. Once I have rolled the mat all the way up the valve can be closed whilst still applying pressure so air does not enter back into the mat due to the lower pressure now existing inside. When the mat is fully deflated and rolled up it can then be stored in a stuff sack. 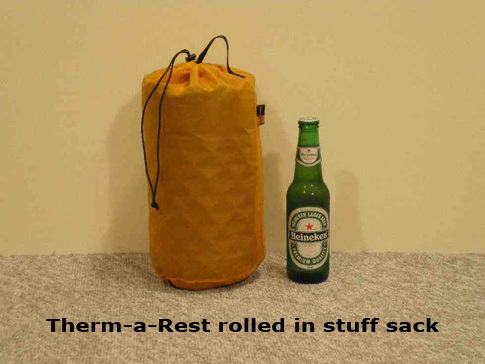 No stuff sacks are supplied with the mat however Therm-a-Rest does have specifically designed sacks for each model of mat. 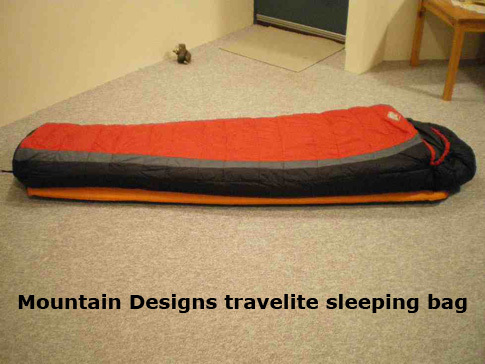 Below I have included an image of the fully inflated Therm-a-Rest with my Mountain Designs down sleeping bag to provide a view as to how the mat is used and the general fit a regular sized sleeping bag has with at regular sized mat. You might notice that the ends of the sleeping bag hang slightly over the mat, however this does not create any issues for me as my feet do not reach the end of the sleeping bag, nor do they hang over the end of the mat. I have found the mat to be very comfortable and provides good cushionin. At no time do I feel that my hips or shoulders are touching the ground. The 3.8 cm or 1.5 in thickness is definitely an advantage. The non-slip properties of the top side of the mat are great and I do not slip around much at all, however it is worth noting that the underside does seem to move around quite a lot which does become annoying. Generally when camping my mat is either on a Tyvek ground sheet or in a tent with a silnylon tubbed floor, I have issues with the mat slipping on both scenarios. To combat this in my tent I have drawn lines on the floor with seam sealer and so far this has proven to be quite effective. I have found the Therm-a-Rest to provide excellent insulation whilst sleeping in a tent or on the solid floors of the three sided huts along the Bibbulmun track. Unfortunately I do not have a device for recording the exact temperatures on my hiking trips, however I was luckily enough to be out one night with someone that was able to record a minimum temperature of 3 C (37.4 F). This was perhaps one of the coldest nights I have experienced and found that the mat did provide me with some extra insulation from the ground inside the hut at the campsite. The manufacturer recommends that the mattress be stored unrolled with the valve open, i.e. inflated with valve open. This is due to the foam remembering the shape it holds most and will also aid in the self-inflating process. The mat should also be stored dry to avoid mildew damage. My mat has never been stored in this manner simply due to the lack of space, it is stored rolled up in a stuff sack with the valve closed. Most people choose to store the mat under the bed however this has not been an option for me. I would like to note that I do not believe this is causing the issue I have with the self-inflation time as this has been a problem since first purchased. I am both surprised and impressed by the amount of information on the manufacturer's website regarding how to find a leak and repair it. 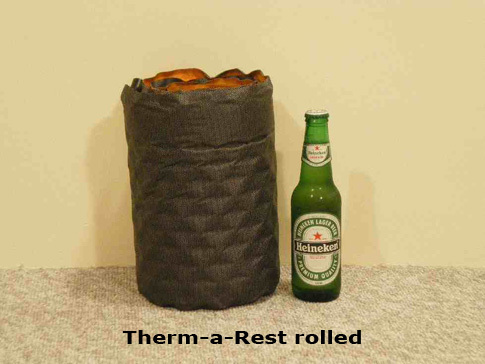 This shows that Therm-a-Rest is well aware of the environments people use their gear in. They want to make sure people are able to care for their mattress. When attempting to find the source of an air leak it is suggested the mat be inflated as much as possible then close off the valve. Fold the mat in half or thirds to increase the pressure, then immerse in water. Look for a stream of bubbles and this is where the hole is. No repair pack was supplied, so the products the manufacturer recommends for repairs might not be available in all countries. Some suggestions are HotBond, SeamGrip, AquaSeal and the glue that comes with a bicycle tube repair kit together with a patch if the hole is large. When out in the wilderness and repairs are needed some suggestions from the Therm-a-Rest website are, duct tape (not for long periods of time as the sticky residue will make permanent repairs difficult), self-adhesive ripstop nylon repair tape or yet again the bicycle tube repair kit. I have to admit that I do not carry any repair kit for my mattress nor have I ever had the need to make any repairs to it. I will however be looking to carry something in the future. The manufacturer's website suggests that the mat should be cleaned with Formula 409 or a household cleaner. They also suggest the use of soap and water in the field, remembering to close the valve to avoid water entering. I have only ever cleaned the mat with warm soapy water and a cloth or non-abrasive sponge. To date my mat looks as though it were brand new as it is cleaned after most trips. This is a mat that I will continue to take hiking with me as I really enjoy sleeping out in the wilderness. This provides me with great comfort making it just that much better. I would like to evaluate the smaller 3/4 length pads in an effort to reduce weight. Little heavy, self inflation takes too long, mat slips around.